Through WordPress, I keep track of which articles people are reading (though I do not collect their personal information unless they leave comments or contact me via the contact form), and over the past few months, I’ve noticed a huge increase in readership for the piece “Lisbon for Children and Teens.” Now that I’m in Portugal, I understand why. 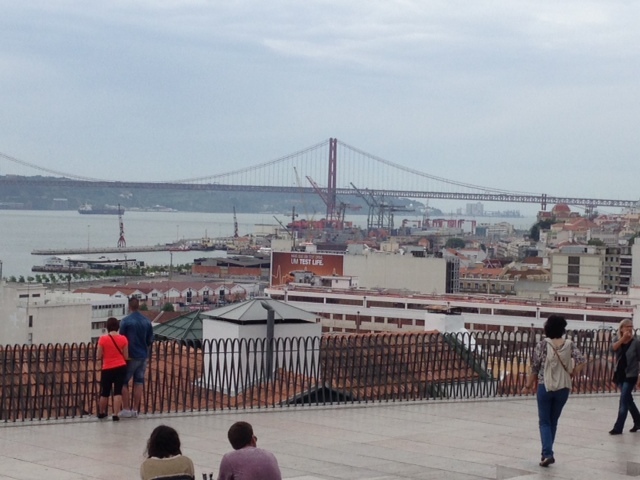 In contrast to earlier years, I’m seeing far more families with children under the age of 18 at popular tourist sites, museums, and restaurants in Lisbon. 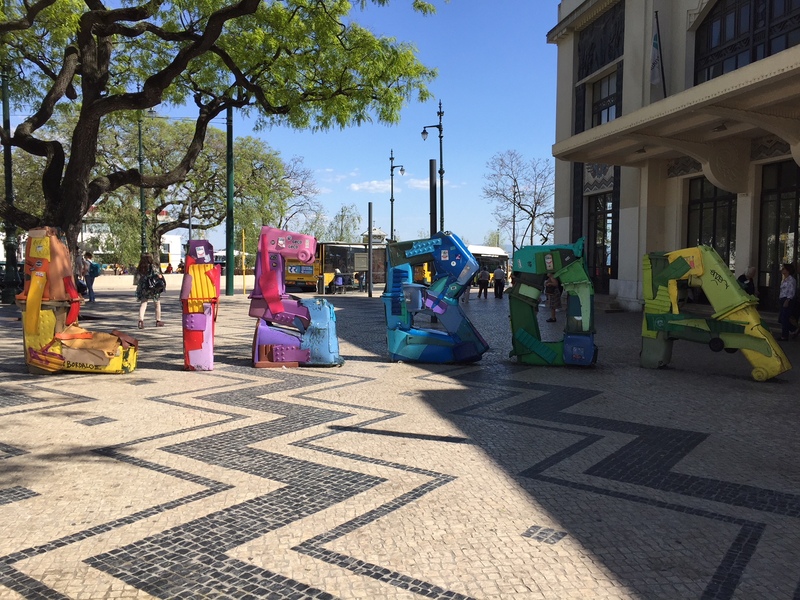 Lisbon’s bright, whimsical street art will appeal to travelers of all ages. In the past, most family travel has centered on the Algarve, a popular tourist destination for all kinds of travelers from within Portugal and beyond. Portuguese families, families from the Portuguese diaspora, and families from Europe’s colder climates (notably the UK) have long owned vacation homes in the Algarve. In recent years, all-inclusive resorts have appeared for travelers of all ages. Like the well-known resorts in the Caribbean such as Club Med or cruises, the family resorts along the coastal Algarve from Sagres to Lagos are especially geared to parents and grandparents who drop their children off in day-camp-like activities and enjoy their own adult activities during the day and in the evening. My Portuguese friends tell me this is not how they vacation; typically, Portuguese children are expected to eat meals and take part in leisure activities with parents and extended family (and are expected to behave while doing so). But Portugal’s travel industry has adapted well to the needs and preferences of families around the world, and the Algarve boasts a number of highly-rated all-inclusive family resorts with great beaches, well-appointed facilities, and engaging, age-appropriate children’s programs. 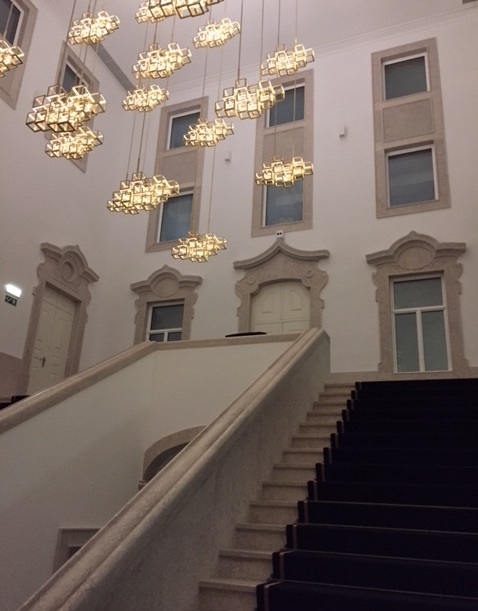 This building in the Bairro Alto area of Lisbon had been abandoned for decades, but now restored, it recently opened as the Lumiar, a luxury apartment-hotel. Restaurants have also evolved to accommodate a wider range of travelers. The hamburger has become a popular imported cuisine in Portugal, as in many other places. International and local chains provide a familiar menu, consistent across locations. And traditional and new Portuguese restaurants do not frown on children sitting alongside their parents; after all, this is what Portuguese children are expected to do. The 25th of April Bridge. Finally, new museums and historical sites with intergenerational appeal are opening all the time. 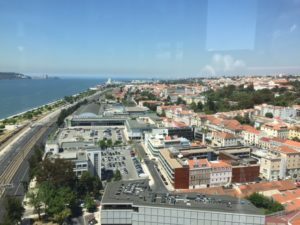 In an earlier post, I wrote about the Lisbon’s African Roots Tour, which will appeal to teens studying that time in history, or at least help to raise their grades in social studies class. Another new museum, the Pilar 7 of the 25th of April Bridge, is designed for children of all ages. Located beside the bridge in Alcântara near the LX Factory — itself a great place to dine and shop — the Pilar 7 experience combines a virtual reality tour with a real-live trip to various levels of the bridge, where visitors can see how it was constructed in the 1960s, modifications made since then (including the lower-level railroad bridge), and the work required to maintain it today. Adults will appreciate the story of the bridge’s construction and how it was designed to resemble the famed Golden Gate Bridge in San Francisco. Children can play on models of the cables at the street level and ride up the elevator to the railroad level (see the trains rumble past!) 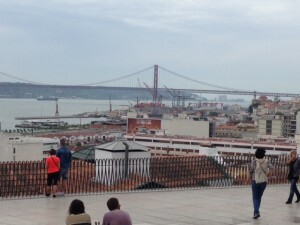 and the very top of the bridge, which offers a breathtaking panorama of the city. While there was a warning for those afraid of heights, as I am, the experience is pretty tame, and at no point did I shrink back in terror. 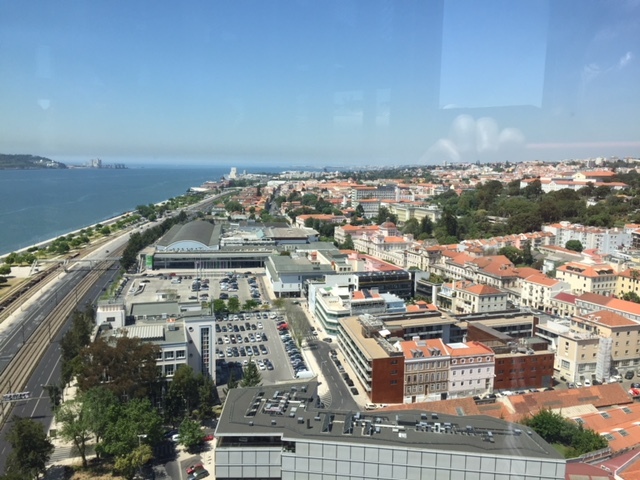 In fact, I was able to take some nice photos; with decent weather one can see all the way to the mouth of the Tagus River and the Atlantic Ocean. The view from the top of the 25th of April Bridge. When it was first constructed, the 25th of April Bridge received the name Salazar Bridge to honor the dictator who arranged and directed its construction. A short, informative film concludes with the replacement of his name shortly after the revolution, which took place on April 25, 1974. While acknowledging the role António de Oliveira Salazar and his regime played in expanding public works in Portugal from the 1940s through the 1960s, one can also see in the film how the arrival of democracy in Portugal led to removing his name in favor of the date of the revolution that ended the 48-year dictatorship. With children in older elementary school and up, this can offer a teachable moment about the naming of monuments and how a society replaces or adapts monuments that glorify a problematic past. Love that street art. So colorful! It’s nice to know that Lisbon is such a family friendly place. Have you noticed an increase in families with children around? Yes, I have noticed more children in Lisbon this year. At first, there were more families in the Algarve, and now they’re making their way to Lisbon. Where I haven’t seen an increase in visitors with children yet is Porto.